Vocabulary – I love reading this book because of the powerful vocabulary used. Martin Luther King fought injustice through the use of powerful words rather than physical violence. I love using this book and having the children experience the power of words. Some examples: courage, peace, freedom. Tone and Style: The author provides accurate information but in a way that many children can access. The book provides a wonderful starting place for class discussion on deep subject matter (segregation, civil rights, fair/unfair, equality, peace, courage, protest). The author combines Martin Luther King’s own words with her own to help tell the “story” of a man who helped change the world. Martin Luther King’s words are shown in large, bold, and colored type so they stand out from the print of the rest of the book. The children in my class love to reread his words when they look at the book on their own. The page where the author talks about his death is always very moving to the kids in my class. The author uses short sentences to state the fact of his death [On his second day there, he was shot. He died.]. This is combined with a black page, dark type for the words, and a dark illustration. Readers can’t help but react with sadness about the loss of Martin Luther King. The life of Martin Luther King, Jr. is told using his own words as part of the text. Martin Luther King is seen as a young boy growing up in the segregated South. We then follow him through adulthood as he becomes a minister and then works to create equality for all. The illustrations and text help to show his belief in peaceful protest. The end of the book has a timeline of important dates in Martin Luther King’s life. I use this book as the second book in my Martin Luther King unit in January. Vocabulary to focus on: peace, equal, march, courage, protest. What does “white only” mean? Why do you think people put those signs up? How did Martin feel about that? Why was Rosa Parks arrested? Was that fair? How did Martin use words to change the world? The time line (in a list format) at the back of the book is a great resource. Many times, this is the first time line the students have seen. Sometimes, I have taken some of the info from the time line and made a linear time line with other dates on it such as when I was born, when they were born, etc. It starts to give them a sense of time. I have the kids choose a phrase of Dr. King’s to put on our “powerful words” list. This also ties into our anti-bullying curriculum by using our words instead of fists to solve problems. At the end of the unit, I have kids write about something they would like to change in the world and how they would do it. Video clip of I Have a Dream speech. 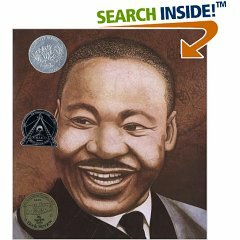 This picture-book biography provides an ideal introduction to this leader and his works. Juxtaposing original text with quotes from King’s writing and speeches, Rappaport’s (Escape from Slavery) narrative offers a pastiche of scenes from King’s life, beginning with his childhood experience of seeing “White Only” signs sprinkled throughout his hometown. He questions his mother about their meaning, and she assures him, “You are as good as anyone.” Listening to his father preach, the boy asserts that “When I grow up, I’m going to get big words, too.” Rappaport also touches upon King’s role in the Montgomery bus strike that followed Rosa Park’s 1955 arrest for refusing to give up her seat to a white passenger and his subsequent efforts as a civil rights crusader. After briefly describing the circumstances of his death, the story concludes, quite abruptly, with the statement, “His big words are alive for us today.” The author relies on her subject’s own words, and his power, passion and pacifism shine through. Collier’s (Uptown) striking watercolor and cut paper collage art feature closely focused, lifelike images of King and other individuals against an inventive montage of patterns and textures. The portraits of King exude his spiritual strength and peaceful visage. In the background of some scenes are intricate recreations of stained glass windows, which, Collier explains in an introductory note, he interprets as a metaphor for King’s life. An elegant, understated pictorial biography. Ages 5-9. Gr 3-5-Collier combines his distinctive watercolor-and-collage art with Rappaport’s uncluttered text to sum up King’s life and work. Each two-page spread begins with a short paragraph about King and his crusade for civil rights, followed by a powerful sample of his own words set in oversized, boldface type. Both portions of the succinct text work together to emphasize the leader’s courage, commitment, and, ultimately, sacrifice without sensationalizing his death. King’s assassination during the 1968 Memphis garbage strike is summed up in just two short sentences: “On his second day there, he was shot. He died.” The book concludes with a reassuring reminder that his words are immortal. Rappaport advises readers to use “Martin Luther King” as the search term to find more than 200 Web sites dedicated to King and the civil rights movement. Both author and illustrator preface the book with brief notes to explain specific aspects of King’s life and death that inspired them in their collaboration. The result is a stunning, reverent tribute.